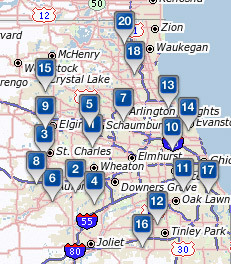 Take a guess at how many Lowe’s stores there are in the near west suburbs of Chicago. Before you guess, there are 18 Lowes in Chicagoland (20 if you include Gurnee and DeKalb). Judging from the map below, I’m glad that Lowes is not a violent militia and Elmhurst its target. Which will attack Elmhurst first? It’s hard to say. 7, 10, 11, 12, 4, and 1 are all about the same distance away.